Medical Assurance Society (MAS) is a finance company with Members all over New Zealand. MAS Advisers around the country regularly meet with their Members to discuss how MAS can help them plan for their successful financial future. To help engage with their Members, MAS wanted a suite of professional, online calculators that their Advisers could use remotely – wherever their Members are. Siso was challenged with converting existing Excel workbooks into a more interactive and graphic product. 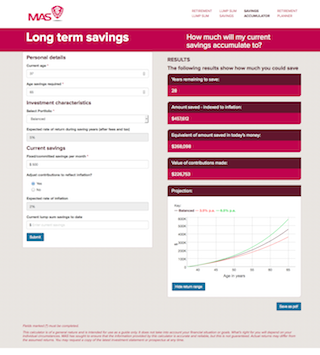 The main advantage of moving the calculators online was being able to add new graphic representations and summary tables to help Members understand what their various retirement scenarios might look like. Advisers would also be able to download the results as a pdf so that they can be easily emailed to Members following the discussion.